As the federal election draws nearer, the now-familiar fear of electing a Harper-led government becomes clearer. This story from our Summer 2012 Youth and Employment issue is about Brigette DePape. In June 2011, Harper had just pulled off a majority Conservative win in an election necessitated by a vote of no-confidence from the House of Commons. DePape was a Senate page, and her demonstration during the Prime Minister's throne speech was ignited by many of the same issues we have against Harper in 2015. Get out there and vote this Monday, October 19! It’s tough to be taken seriously as an activist when you’re decked out in a bow tie and white gloves, but somehow Brigette DePape managed just fine. 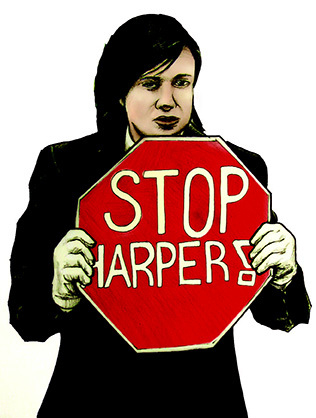 The 22-year-old from Winnipeg first came to national attention with her “Stop Harper” protest in the Canadian Senate. On June 3, 2011, she stood silently through Prime Minister Stephen Harper’s throne speech, as any dutiful Senate page would. But when she pulled out a homemade stop sign printed with “Stop Harper” in block letters, she started a conversation that was heard all over Canada. DePape was swiftly ejected from the Senate and fired from her page position. She needn’t worry: soon after, job offers rolled in from the Council of Canadians and filmmaker Michael Moore. She later told the Toronto Star that she staged her protest because she “had a responsibility to use [her] position to oppose a government whose values go against the majority of Canadians.” As a page, DePape watched as the Harper-led Conservative government moved to “spend billions on fighter jets we don’t need, to pollute the environment we want protected, to degrade a health care system we want improved, and to cut social programs and public sector jobs we value.” She cited 2011’s Arab Spring as an inspiration for her act of civil disobedience. DePape likes to combine theatrics with political statements. While studying at the University of Ottawa, she wrote the play She Rules with Iron Stix, a one woman show about baton-twirling and environmental sustainability. She performed the show at Fringe festivals across Canada and as a TEDxYouth talk in Ottawa. She’s been described as a rogue and as a new star on the activist scene, but Depape’s combination of theatrical protests and politics gets Canadians talking. It’s clear to us that her blend of formal wear and fight-the-power attitude is a winning combination.